The Fellows 2015/16: Marina Vishmidt & Anthony Iles, Elvis Krstulović (Fokus Grupa), Benjamin Tiven, Andrea Bellu, Iva Kovač (Fokus Grupa) with Andrei Siclodi, Director Künstlerhaus Büchsenhausen. 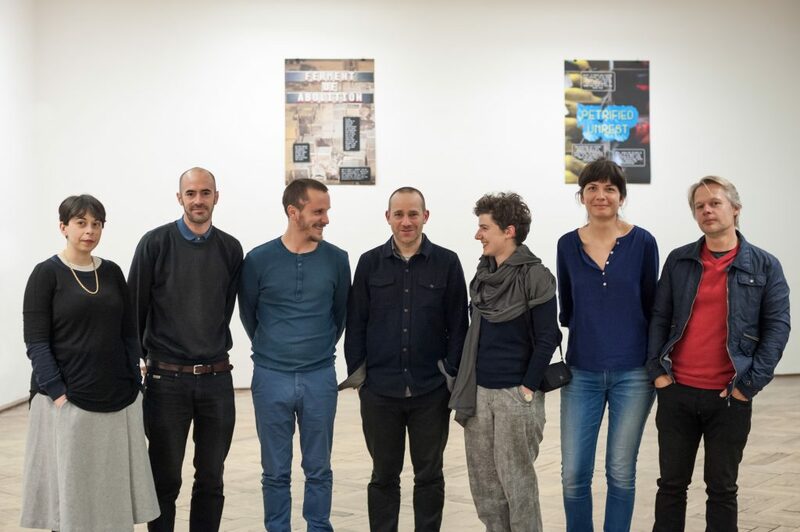 The new Fellows – Andrea Bellu, Fokus Grupa, Benjamin Tiven und Marina Vishmidt & Anthony Iles – with their respective proposals are raising questions – in a broader sense – about the constitution and effect of the imaginary in critical art practices. The so-called Start-Up Lectures of the International Fellowship Program for Art and Theory 2016/17 will take place in Büchsenhausen at 7 pm on Friday, 16th October 2015. In the context of the Start Up Lectures 2015/16, as well as in the exhibition Economies of the Imaginary, which will be opened at the same time as the Start Up Lectures, the Fellows will present their work and their plans for the coming months. Andrea Bellu develops her artistic works as installations, writing, drawing, taking photographs and making films. She often works together with other artists and scientists. Starting out from post-colonial, migrant and feminist perspectives, she attempts to insert further gaps and disruptions into the predominant narrations of history. While traveling through Silesia, Galicia and Bukovina in 2014 and 2015, Andrea Bellu began to gather together material: pictures, conversations, landscapes, sunsets, literature. From all this an intuitive, unfinished archive emerged, which the artist will investigate during her fellowship in Büchsenhausen. The route of travel encompassed an historical cultural sphere, in which different minorities lived alongside and with each other for centuries, without a national majority population. In many villages and towns the Jewish population constituted the biggest minority. This complex and multilayered cohabitation was put to a cruel end by German occupation and the German politics of annihilation during the Second World War. Continuing her practice to date Andrea Bellu’s prime concern is to connect the frequently recounted and described, violent history of the early 20th century to the present day, and to visualize its present, ever tangible effects and continuities. The work in Büchsenhausen will mark, first and foremost, the beginning of an undertaking with a currently unforeseeable conclusion. Fokus Grupa is an artist collective based in Rijeka, Croatia. Their work points to the social, economical and political frames of the art field. Their practice is collaborative and interdisciplinary, and they work across art, design and curating. Fokus Grupa concentrates on the relations between art and its public manifestations, in terms of working culture, aesthetics, and social and economic exchange values. Starting from the influential book “Chto Delat” by the Russian philosopher, journalist and literary critic Nikolay Chernyshevsky (1863) and his concrete descriptions of the living (and working) spaces of the two main protagonists, Lopuhov and Pavlovna, Fokus Grupa intends to research into various cases of literary, visual, design and architectural proposals, prototypes, ideas, projects and practices that have been dealing with the idea of social transformation via the design of utilitarian objects since Modernism, considering living spaces in particular. In researching these cases Fokus Grupa wants to look for their potential but also to examine their miss-realizations, and miss-appropriations by corporate culture and corporate production (i.e. International Style, IKEA etc). Benjamin Tiven is an American filmmaker and writer. At Büchsenhausen he is working on a research and production project set around the graphic economy of televisual media. This project continues to elaborate the political, technological, and economic dimensions of public media; the aesthetics of television when applied to cinema; and the imagined narration of real events. At its center is a long-format exploratory film prompted by the text Economy of the Unlost by the Canadian poet and essayist Anne Carson, with dialog in German and Greek. The film will be shot mainly in Athens, in the facilities of the public media channel ERT. While avoiding a documentary re-telling of ERT’s tumultuous recent past, the film will use this particular studio as a scenography within which to translate this text into a cinematic production. Marina VISHMIDT is a London-based writer occupied mainly with questions around art, labor and value. Anthony ILES is a writer of criticism and fiction based in London. Since 2009, Marina Vishmidt and Anthony Iles have been working together on a series of essays, posters and presentations expanding their common interest in the relation of artistic practices to social crisis by reflecting on the roles of machines, labor and value in capitalist reality and communist philosophy. They ask: How do art’s encounters with destruction help us to track the historical nature of negativity, serendipity and accident in art specifically and in capitalist culture more generally? The project will try to analyze forms of (self-)abolition, negation and subsumption as they figure in concrete instances of artistic production, and find systemic resonances with the current entropy of capitalist society. Recent tendencies show that art is more often affirmed than negated by its incorporation of the ‘outside’, accumulating more efficiently than the crisis capitalism it ransacks for its themes. Marina and Anthony will use the discursive context of Büchsenhausen’s Fellowship Program to open this work to further development and discussion, eventually bringing the common thread of these conversations and written work into a co-authored book, as well as developing an archive of the process incorporating contributions from interlocutors, who will participate in their working and staging process at Büchsenhausen.